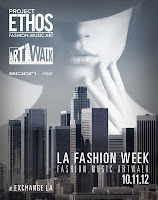 The first Project Ethos event was held on August 27th 2005 at the El Rey Theater in L.A. Not only was it the first time fashion, art, and music were combined into one event but it was also open to the public. Buyers, showroom reps, art collectors, press, and consumers were (and still are) invited to discover emerging talent via the creative platform provided by Project Ethos. 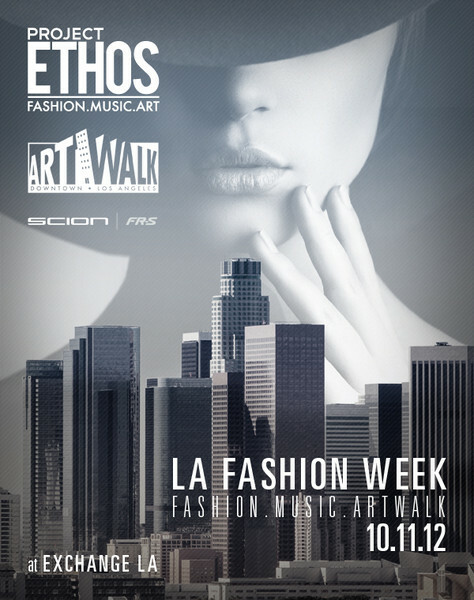 The SS2013 presentations took place during Art Walk in the midst of Fashion Week SS13 at the Exchange LA, which was packed with fashion aficionados, music lovers, art connoisseurs, celebrities, and stylists. The evening consisted of a runway showcase by emerging designers, live performances, a sprawling art gallery featuring live paintings, a pop up gallery, and DJ sets throughout the evening. Guests mingled in the art gallery and viewed works by Tanina Jackson, INDEPTH, Max Neutra, Mark Jacobs, James Rhodimer, Amy Baca Lopez, Sara Ramirez, Steven Michael O’Connor, and Dan Monteavaro while enjoying beats by DJ Robb Rockwell and Mando Fresko. The emerging designer showcase presented a number of edgy and innovative designs. Jose Galeana, the man behind Galeana Designs, started things off with a collection that was inspired by Hollywood sci-fi and centered upon bright reds, light blues, and dark purple. Marialia Pacitto’s Marialia collection featured glitter bikinis, flirty dresses, and booty shorts. Of course I loved the ones that said “Bite Me.” I may have to get a pair. Check out the video here. Linden designer Jennifer Krischer sent high waist shorts, cigarette pants, and structured jackets in pastels down the runway. Nine Menswear, designed by Andre Myers, exhibited some casual looks in addition to their underwear collection. Check it out. B. by Aperire brought the presentation to a close with their eclectic footwear collection. I’ve long been a fan of their cutting edge styles and fashion forward designs. They are one of the few designers that make comfortable statement making footwear. Check out our boutique feature here. In between runway shows the Icelandic Pop group The Charlie’s entertained us in the main room. The second showcase featured looks by: Felicia Barth-Aasen (Collective 26), Claudia Gonzalez Pruitt (Beso Moda), Lawren Michele Cappelletti (Lawren Michele) and Kiki Hasija (ARIA by Kiki Resort Wear). The night ended with the “Synthesis” after party featuring a performance by electro club duo Oliver, a presentation of Goorin Bros latest hat collection, and a DJ set at midnight from model turned DJ Caroline D’amore.